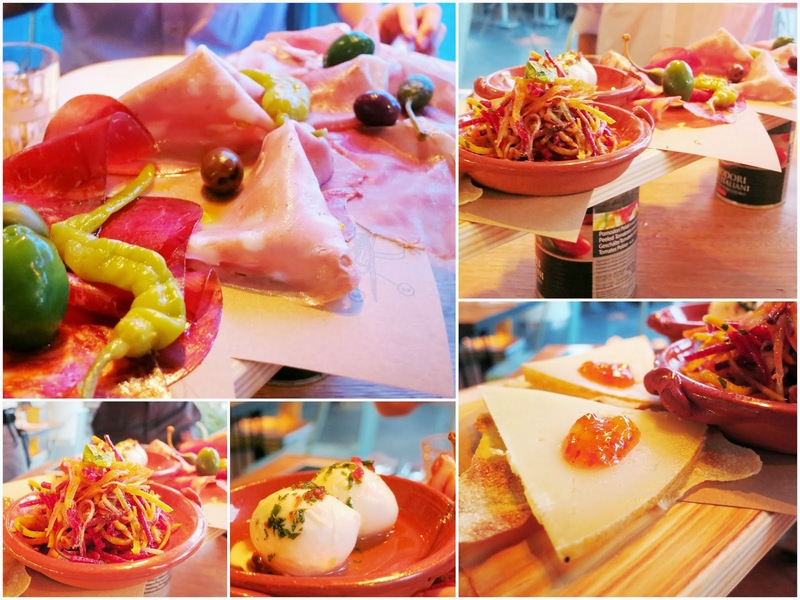 PinkyPiggu: A Revisit to Jamie's Italian Singapore @ Vivocity ~ The Angus Prime Rib & Pink Snapper Are Must-Trys! 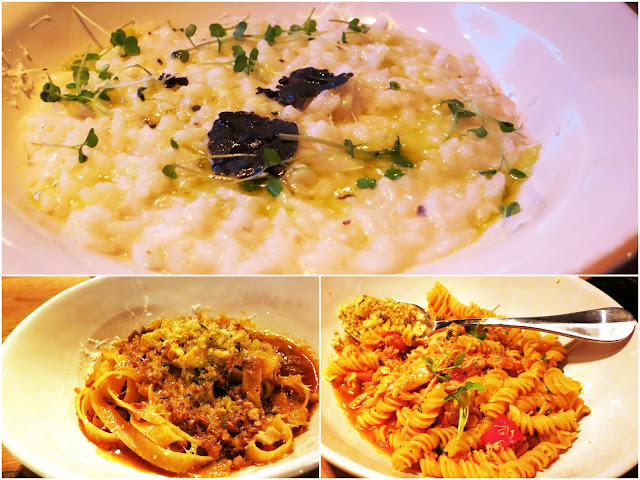 A Revisit to Jamie's Italian Singapore @ Vivocity ~ The Angus Prime Rib & Pink Snapper Are Must-Trys! I actually visited Jamie's Italian twice within its opening week lol! The first visit was impromptu with Daniel, this second visit was prior arranged with Derrick, Nat and FC. What made me visit the Naked Chef's restaurant in Singapore's Vivocity again within such a short span of time? Other than not wanting to 'fly kite' the guys, it's food of course, FOOD! What was served up during the first visit was pleasant enough to make me wanna try the other items on their menu. This time round, I had the main courses of Angus Prime Rib and Pink Snapper which turned out to be utterly delicious! Absolutely worth every cent and calories! The 30-Day Matured Prime Ribs ($59.50), though being the most expensive item on the menu, did not deterred us from ordering it. We exchanged our moolah for this slab of 350g Angus breed bone-in strip loin served with wild mushroom and peppery endives and were gratified beyond no regrets. Done to a medium-rare perfection with a blushing pinkish centre, it was juicy, flavorful and ooh so melt-in-the-mouth tender. We opted to top up $5 for a luxurious spread of truffle butter and shaved Tuscan black truffles over the meat and it was a yummy decision indeed. No less enjoyable is the Pink Snapper Acqua Pazza ($32), which sounds pretty (pink!) and tasted delicious! A whole pink snapper is pan-fried and bathed in a savory sauce of olives, garlic, wine, capers, parsley and the sweetest baby plum tomatoes. We all agreed this was very well-executed and certainly is a must-order! The Tagliatelle Bolognese was still as lovely as during my first visit and we all enjoyed this robust tasting "ang moh bak chor mee" lol. Very appetite whetting is the Tuna Fusilla with its tangy tomato sauce, but it did not send me into moments of elation like the Wild Truffle Risotto did. The deceivingly plain looking risotto revealed itself to be wonderfully al-dente and flavorsome! Love the light buttery sauce and addictive scent of truffles. However I must admit that I don't think I will enjoy this dish as much if I were to finish a full portion on my own, for it can become quite monotonous after a while. I need to be captivated with some highlights and contrast in texture. Maybe throwing in some mushrooms would be a good idea? Having tried the delish Baked Mushrooms ($12.50) and Crispy Squid ($11.50) during his previous visit, Derrick suggested that we order these two antipasti but they were already sold out though it's only 7pm+ in the evening. We settled for the Meat Plank ($15.50 per person) comprising of cured meats, cheeses, pickles and crunchy salad instead. This would be something which I probably wouldn't order again. Not that it taste bad but the cold cuts doesn't really excite me much. I refused to let the dinner end if I don't see any desserts on the table lol. The Creamy Panna Cotta ($9) seemed to be more wobbly previously, but still none the less lovely. Tutti Frutti Lemon Meringue Pie ($11.50) spots a colorful cheerful look bursting of sweet lemoney taste with limoncello and crunchy pistachio brittle. It was enjoyably refreshing without being cloying sweet. Lovely place, and the food looks great too. Hello there ! Your blog is very informative and gracefully your guideline is very good.Thank you for sharing this wonderful blog.